Stitch Sampler Photo Sharing…and more! Good morning and a Happy Saturday all around! I’ve been fiddling about, setting up a photo sharing area for projects based on my new ebook, Stitch Sampler Alphabet. I’m hoping that many of you are enjoying the stitches and instructions in the book, and that you’re already engrossed in the addictive practice of combining embroidery stitches in colorful, fun, and unique ways! And if you are, then I thought it would be nice if we could all share photos, to inspire each other. To that end, you’ll find a new group of Flickr called Stitch Sampler Alphabet. where you can view photos posted by others and where you can post your own photos of your own embroidery projects based on the designs, stitches, or instructions in Stitch Sampler Alphabet. Even if you aren’t stitching up any of the projects, you’ll be able to peruse the photos in the group and enjoy what other folks are stitching up. The photo sharing isn’t limited to just decorative initials, either. Maybe you’re a crazy quilter, and you’re enjoying using the stitches, combinations, and composites on crazy quilt seams – that’s terrific, and we’d love to see your work there, too! Maybe you’ve used some of the composite stitches in a crewel embroidery piece, or perhaps you’ve framed an inspirational quote with some of the stitches you learned in Stitch Sampler Alphabet – well, come on over and share with us! You can discuss your stitching adventures from Stitch Sampler Alphabet in the group, too. Maybe you’ve discovered a new stitch combination you’d like to share? Or perhaps you stitched up one of the letters with a completely different thread, and you’d like to chat about the results? Have you run into a snag and could use help or advice from other stitches? You’re most welcome to use the discussion area in the group for anything Stitch Sampler Alphabet related. I’ll even pop in now and then and join in the chatter! I’ve already added about a dozen photos to the group, some full-letter shots from the book, and some detail shots. Now it’s your turn to add some photos! Flickr is free for basic use, so if you don’t have an account, you can sign up. But even if you don’t have an account, you can still view the photos in the group. 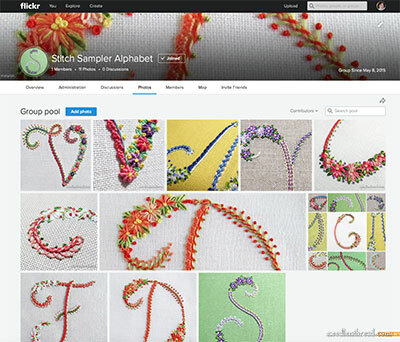 You’ll find the Stitch Sampler Alphabet Flickr Group here, just waiting for you! The day after Stitch Sampler Alphabet was released, I received an email from Jessica Grimm, who had already stitched up a letter from it. She’s quick! She used a combination of different silk threads on her letter M, which she embroidered as a gift for her mom, and it’s Just Lovely! I love the way she used the finished letter, too. Hop on over to Jessica’s blog to take a look! There’s also a very nice review of Stitch Sampler Alphabet over on Coeur de Freesia – thank you, Elena! And the book got a very nice mention over on Magpie’s Mumblings as well – thanks, Mary Anne! When I launched Stitch Sampler Alphabet, I made this little video, which I shared on my Facebook page. I just realized this morning that I haven’t shared it with you yet, though. It’s a happy video! I hope you like it! Newsletter recipients, you can view the video on today’s article on Needle ‘n Thread. I hope you have a wonderful weekend and can spend some good quality time with your needle and thread. We’re expecting more rain, more storms here in Kansas, so it’s good indoor stitching weather. I’ll be crossing One More Thing off my embroidery project list today, fingers crossed. I guess I need to step bravely into this century and open a Flickr account, lol! Here in Dallas, it’s been raining all week, so I’ve managed to make quite a bit of progress on my monogram experiments. I’m trying different stitch combinations on various styles of lettering, some with not-so-great success (because I stitched out of sequence, rookie mistake), and some are turning out really well! I have an idea for some embroidered book covers and slip cases, so all of the letters I’m working on right now are practice pieces for what I hope will be some really stunning books inspired by your stitch combinations. I’m also playing around with some of the stitch combos for exposed bindings…thread, needles, and chipboard are all over the place! Point of this very long post being: With your book, you’ve inspired beyond the monogrammed Christmas stockings that I thought would be my main reason for buying it in the first place! Can’t wait to see everyone’s photos! Wow, you’ve been busy, Liz!! I’m excited to see what you’ve done with the letters! And I’m so glad they’ve turned into all kinds of ideas for you! Thank you for mentioning me so generously on your blog! Can’t wait to check out the Flickr group and the other blogs you mentioned. I can see millions of flowery initials take over the world :). Hi, Jessica! Well… I think the world would look pretty good in flower initials, don’t you? Glad to see the finish photo in the Flickr group! I think it’s fun to have a place to share photos and hopefully, a lot of us will find it’s a good place to stitch along together and bounce ideas back and forth. We shall see! I clicked over to your blog, and got lost there for a good hour! Beautiful work, and the purple silks you used for your mom’s monogram are so, so pretty! Thank you Liz! I love to get lost in embroidery blogs too. There is just so much talent out there. Great idea, Mary, for sharing inspiration.From time to time we all need a fresh breath of air or a little memory nudge in our creative journey. I just loved the music that went with the video (that was pretty and nice too). Could you let me know what the tune is and who the musicians were? Previous Previous post: One Finish Down the Drain!